Provided photo Elementary School Principal Michelle Lavey (left) with student Jasmine Brown (right), who was recognized during the Bradford Board of Education’s student spotlight. 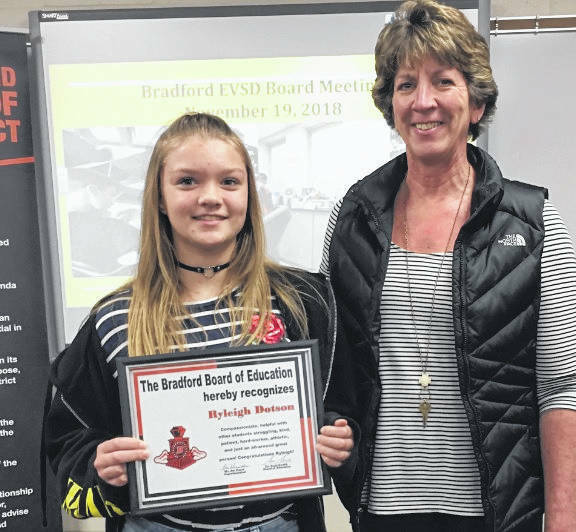 Provided photo Student Ryleigh Dotson (left), who was recognized during the Bradford Board of Education’s student spotlight, with her fifth grade teacher Cindy Angle (right). Provided photo Speech therapist Emily Beck, who was honored during this week’s Bradford Board of Education meeting, with Elementary School Principal Michelle Lavey. Provided photo Teacher Brian Schwieterman (left) with student Shaun Rismiller (right), who was recognized during this week’s Bradford Board of Education meeting. Provided photo The Bradford High School’s girls’ cross country team was recognized during this week’s Bradford Board of Education meeting. Pictured from left to right are Coach Daugherty, Austy Miller, Mercedes Smith, Olivia Daugherty, Alexis Barhorst, Jenna Shellabarger, Skipp Miller, Coach Grillot. Not pictured is Karmen Knepp. BRADFORD — The Bradford Board of Education met this week and recognized a number of students during their student spotlight. Student Jasmine Brown was nominated by her fourth grade teacher, Brittany Clark, and Elementary School Principal Michelle Lavey presented Brown with the student spotlight award. In her nomination of Brown, Clark said, “Jasmine is always a pleasure to have in class. She works very hard on independent assignments, and is never afraid to ask for help.” Clark went on to say that she admired Brown for including other classmates who may have felt left out, adding that Brown has a positive attitude. Student Ryleigh Dotson was nominated by her fifth grade teacher Cindy Angle, who also presented Dotson with the award. Angle said that Dotson has a “huge heart” and shows genuine concern toward others. She added that Dotson is also a “great student with an awesome work ethic.” Dotson is also an athlete involved in softball and basketball. She has been involved on the elementary student council for two years. Student Shaun Rismiller was recognized by his teacher fifth grade teacher Brian Schwieterman, who described Rismiller as “a staple of what every student should strive to be.” Schwieterman said that Rismiller “works incredibly hard with a tremendous amount of respect for others.” He added that Rismiller is fun to have as a student is a a good example for other students. The board also recognized the girls’ cross country team, noting that the team won the Spencerville Bearcat Invitational, and are the CCC Champions, with Skipp Miller, Karmen Knepp, and Austy Miller placing first, second, and third. They were district runner-ups and placed third at regionals. Coaches Rob Grillot and Bob Daugherty along with students Austy Miller, Mercedes Smith, Olivia Daugherty, Alexis Barhorst, Jenna Shellabarger, and Skipp Miller attended this week’s board meeting. Also during their meeting, the board accepted a number of of donations from the Miami County Foundation on behalf of the district, including $5,396 for the Bradford High School publications class to purchase cameras; $4,500 for the band to purchase french horns; and $4,144 for the school district to purchase radios and technology for administrators and custodians. The board also accepted donations from Rogers Grain Inc for both Bradford and Covington FFA for $300; from Anna Bier Gallery for the Art Start Program award for $400; and from the Covington Eagles for $7,000 for the district. The board also approved a three-year contract with the auditor of state at a rate of $50 per hour with the total cost not anticipated to exceed $1,650 per year. https://www.dailycall.com/wp-content/uploads/sites/30/2018/11/web1_Bradford-BOE-Jasmine-Brown-COPY.jpgProvided photo Elementary School Principal Michelle Lavey (left) with student Jasmine Brown (right), who was recognized during the Bradford Board of Education’s student spotlight. 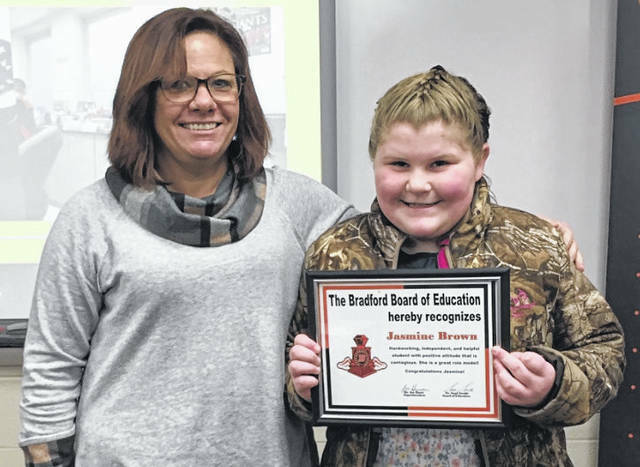 https://www.dailycall.com/wp-content/uploads/sites/30/2018/11/web1_Bradford-BOE-Ryleigh-Dotson-COPY.jpgProvided photo Student Ryleigh Dotson (left), who was recognized during the Bradford Board of Education’s student spotlight, with her fifth grade teacher Cindy Angle (right). 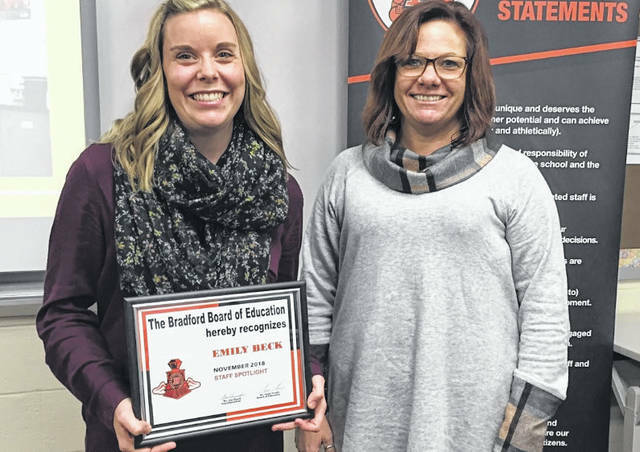 https://www.dailycall.com/wp-content/uploads/sites/30/2018/11/web1_Bradford-BOE-staff-spotlight-Emily-Beck-COPY.jpgProvided photo Speech therapist Emily Beck, who was honored during this week’s Bradford Board of Education meeting, with Elementary School Principal Michelle Lavey. 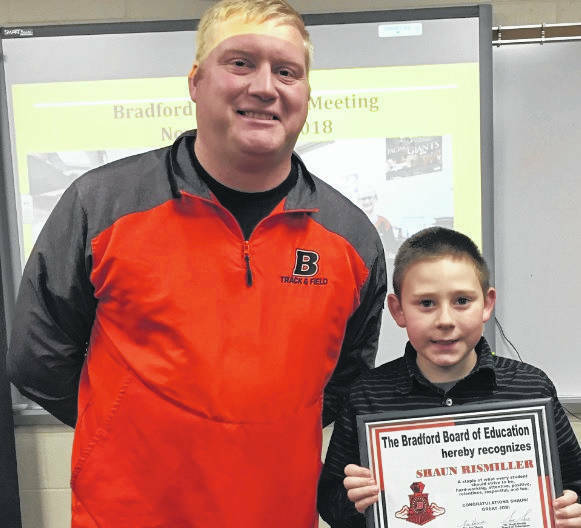 https://www.dailycall.com/wp-content/uploads/sites/30/2018/11/web1_Bradford-BOE-Shaun-Rismiller-COPY.jpgProvided photo Teacher Brian Schwieterman (left) with student Shaun Rismiller (right), who was recognized during this week’s Bradford Board of Education meeting. https://www.dailycall.com/wp-content/uploads/sites/30/2018/11/web1_Bradford-BOE-girls-cross-country-COPY.jpgProvided photo The Bradford High School’s girls’ cross country team was recognized during this week’s Bradford Board of Education meeting. Pictured from left to right are Coach Daugherty, Austy Miller, Mercedes Smith, Olivia Daugherty, Alexis Barhorst, Jenna Shellabarger, Skipp Miller, Coach Grillot. Not pictured is Karmen Knepp.